From 'Tory values' to Soviet throwbacks: Who can claim victory over the UK's Olympic success? The UK's Olympic triumph can be measured in more than bronze, silver and gold. 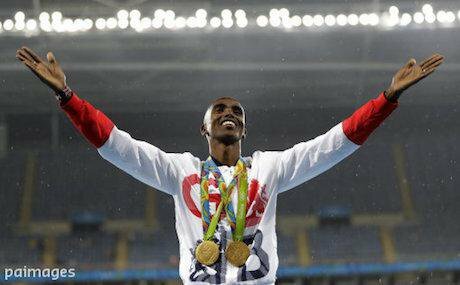 Mo Farah celebrates his two Olympic gold medals. Photo: Jae C. Hong / AP/Press Association Images. All rights reserved. Rio 2016 has made the headlines, and not always for the right reasons. Before the games, there was the backstory of Brazil's lack of preparation, corruption and wasting of billions in a country without basic sanitation and health facilities for millions of its population. As the games got underway, one of the big stories became that of British success – as medal after medal was won, with Team GB achieved second place in the medals table ahead of the Chinese. Its final tally exceeded the number of medals won four years previously in London 2012 (65 then; 67 now). The tales of success - Jason Kenny and Laura Trott at cycling, Andy Murray at tennis, medals in dressage and swimming - have captivated a nation and even provide a hint of nostalgia by being screened on the BBC without adverts. Whilst in 2012 £264 million of funding worked out at £4,061,538 million a medal, in Rio £355 million of funding produced £5,298,507.46 per medal. Such achievements come at a price: envy, backbiting, and even sour grapes. German track cyclist Kristina Vogel said of British cycle success: "They were cannon fodder when you look at the last few years. Now they come along with a high level." French coach Laurent Gané said: "The recipe should be asked for from our neighbours because I don’t understand." None of this happened by accident. Ever since the embarrassment of the Atlanta Olympics in 1996 when Britain won its lowest ever tally of medals for years (a solitary gold) there's been a consistent upward trend in the UK's medal tally. This was bolstered by monies from National Lottery under the direction of UK Sport, who had responsibility for administering the £355 million fund for Rio. The most over the top criticism came from curmudgeon Simon Jenkins in The Guardian, comparing British celebrations of success to the Soviet era writing "Soviet bloc nations used sport as a proxy for economic success', when nowadays all nations do. The games represented "the nationalisation of sport" and British success "the hamfisted draping in the Union Jack." Where has he been these last 20 years in the Olympics or World Cup? Clearly not watching very closely. Even more wrong-footed was Tory supporter and free-schooler Toby Young claiming the games as a triumph of ‘Tory values’. These apparent Tory values are "hard work and dedication will lead to success", "the power of patriotism", "the importance of family" and a ruthless, "no compromise approach" from UK Sport in picking winners. In what kind of bizarre world are these universal principles ‘Tory values’? Presumably that of the Daily Mail. Young even claims that the success of Adam Peaty, Britain’s first swimming gold medal winner in 28 years, is down just to those immediately around him, writing "it was a strong family support network – that helped create a champion, not a nannying, state machine." In truth, it was a mix of individual commitment, family and friends, and a state with money able to pick winners, in the way the UK has refused for years to do in industry and investment. And Young should know the importance of central government funding in honing individual talent; as former CEO of the West London Free School, he was directly the beneficiary of Department of Education largesse. [a] recent history of the modern Olympics shows that there never was a golden era. There are lots of problems with the modern Olympics. The patronage of the International Olympic Committee, as with FIFA in football, grants them the power and resources of virtual private states. The contracts they force on host countries and cities involve tax avoidance by them, lack of accountability and transparency. The author David Goldblatt’s recent history of the modern Olympics shows that there never was a golden era. From the outset, these were less about sport, than national superiority and the triumph of rich nations over the poor, all still evident to this day. The continents of Africa and South America are nearly entirely missing from the Rio medal table. Rio 2016 shows that international sport isn’t left just to sportsmen and women, but about money, commercialisation, and the pressure to succeed and thrive on stress. After London’s Olympics, some tried to draw wider lessons about social change from the games success. Harry Burns, then Chief Medical Officer for Scotland, commented that success at cycling showed how to change a society: "Small changes in a lot of areas deliver a big change." But winning at cycling isn’t similar to social change. Clearly, massive public investment can bring about national success. The Olympic medal haul confronts us with the question of how we measure that success; as the triumph of 'Tory values', or as testament to the potential of public investment in private prowess. In answering this, we must also ask ourselves just how much we can jubilate when this success is hosted by an organisation as deeply dubious as the International Olympic Committee. These are questions not just about how we want to organise our sport, but about how we want to organise our society. Lets enjoy Britain’s success, but not get too carried away – either as killjoys like Simon Jenkins or crazed optimistic patriots such as Toby Young. The games do show some things. That the world is not particularly equal, and those with advantage, support, networks and skills, can be and already are winners. They also show what £355 million can buy you, namely, a lot of medals, attention and a bit of national prestige. However, this doesn't amount to a British wide renaissance. And it is more than likely, as we all bask in this summer of British success, that these will be either the last, or second last ever, Team GB games.